The name Cocker Spaniel is used for two closely related breeds: the English Cocker Spaniel and the American Cocker Spaniel. In North America, a dog referred to simply as Cocker Spaniel is most likely an American Cocker Spaniel, while the opposite is true in Europe. The English Cocker Spaniel is closer to the working-dog form of the Field Spaniel and the Springer Spaniel than its American relative. In the late 19th century, English Cocker Spaniel dogs were brought from the United Kingdom to Canada and the United States and the breed received their own AKC (American Kennel Club) Stud Book quite soon after the turn of the century. In 1946, the American Kennel Club decided that the English and American varieties were so different that they should be considered separate breeds, and the English Cocker Spaniel was given its own AKC Stud Book. This article contains Cocker Spaniel dog information about the English Cocker Spaniel. In many regards, the two breeds have virtually the same requirements and characteristic, but there are a few major differences. If you want more specific Cocker Spaniel dog information about the American variety do not hesitate to contact your local Kennel Club or (American) Cocker Spaniel organisation. The ideal coat for an English Cocker Spaniel is flat and silky on the body and features medium long feathering on chest, belly, ears and on the backs of the front and rear legs. This type of coat is fairly easy to maintain, and the major part of your Cocker Spaniel dog care will consist of simple brushing and combing to avoid shedding and matting. Clipping is only required around head and ears. Use a scissor to remove excess hair around the feet and tail. Some specimens will have a bushier or woolly coat, and this type of coat will require more care than the ideal variety. During each grooming session, you should always check the eyes, ears and mouth of your dog for signs of illness. Due to their pendulous ears, Cocker Spaniels are prone to ear infections. The Cocker Spaniel dog is easy to care for and is a great choice if you want a close companion. Before you go out and get an adorable little Cocker Spaniel dog puppy, you should however ask yourself if you will be able to provide it with enough time and attention for the next 12-14 years or more. 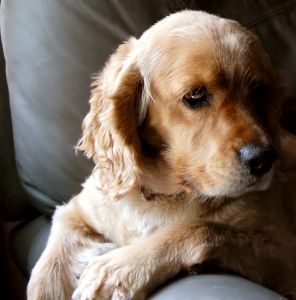 The Cocker Spaniel dog is a typical pet dog, and if you force it to stay alone too much it will become depressed and can start developing destructive behaviours. You should also ask yourself well in advance which things that should be allowed for your dog and which things that should be forbidden. If you for instance allow your Cocker Spaniel dog puppy to sleep in your bed, it will not be able to understand why you are yelling at it for running directly into your bedroom after some nice playtime in the mud. Cocker Spaniel dog training is not very difficult, and the breed is known to respond well to praise and attention. Since it is such a popular breed, it is also easy to find Cocker Spaniel obedience classes if you want some help with the training. One important aspect of Cocker Spaniel training is to gain control over natural behaviours such as barking and digging, otherwise your dog can start developing bad habits. Most Cocker Spaniels still have a lot of their retrieving instincts left and will happily enter water, and training your Cocker Spaniel to pick up things and bring them to you is very easy. 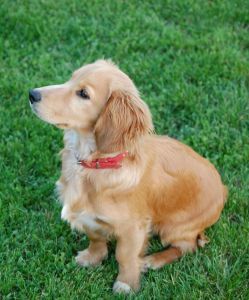 When it comes to Cocker Spaniel dog breeding, the English Cocker is has been kept slightly bigger than the American variety. Other distinguishing characteristics are the longer, narrower and more Setter-like head. For show dogs, the allowed colours vary from country to country, but for pets and working dogs the colour is naturally not very important. Some hunters do however prefer Cockers with white markings since this makes it easier to see the dog during hunts. The English Cocker Spaniel is generally a healthy dog, but there are a few known health problems and it is therefore important to stick to serious and knowledgeable Cocker Spaniel dog breeders that know how to promote good health in the breed. Since the Cocker Spaniel is such an extremely popular breed, there are unfortunately insincere breeders whose only aim is to produce as many puppies as possible without regard to physical or mental health. There are also Cocker Spaniel dog breeders who focus solely on outer appearance in pure breeds, and this type of breeding can lead to aggressive Cockers. The main health problems present in the English Cocker Spaniel breed are kidney disease, epilepsy, progressive retinal atrophy and hip dysplasia. The exact Cocker Spaniel dog price varies significantly from breeder to breeder, and also between different parts of the world. Giving any general recommendations is therefore impossible. The important thing is to compare different available breeders to each other and find out what you actually get for your money. Sometimes the Cocker Spaniel dog price will be high because the breeder has invested a lot of money in obtaining vet-checked parents and creating a high-quality kennel, but in other situations the Cocker Spaniel dog price is high simply because the seller is a greedy puppy-mill owner. Don’t forget to ask for proof of veterinary exams; vaccinations and de-worming before you decide from which breeder to buy your puppy. A healthy Cocker Spaniel dog price can be expected to live 12-14 years.